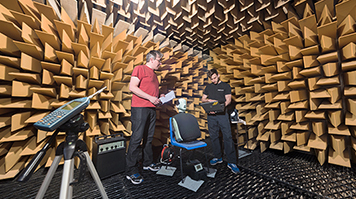 LSBU is proud to host specialist acoustic facilities for sound and noise research. Take a tour of the acoustic laboratory. The Anechoic Chamber (anechoic meaning echo-free) is a specialist facility that has been carefully designed and built to achieve almost perfect quiet conditions. Within the chamber, external sound is not allowed to break in and sound reflections off internal room boundaries cannot occur. Almost perfect acoustic isolation is achieved by a "box in a box" construction made of very heavy concrete walls and internal surfaces made of 70cm long foam wedges and large, heavy sound-proof doors. The inner box is mounted on springs to avoid the transmission of vibration from London Underground trains which run underneath the chamber. The suspended floor is made from a metal grill so that heavier equipment, up to 50kg, can be measured. This chamber allows sound power levels to be accurately determined, frequency responses to be measured and pure recordings to be made. Recordings can later be processed to create aural simulations of virtual environments. The chamber has a range of commercial applications, such as being able to accurately determine the sound power of commercial or industrial units e.g. refrigeration systems, heat exchangers, thermostats and fans. When the Royal College of Music, Centre for Performance Science wanted high fidelity audio recordings of audience applause, they turned to the acoustic labs at LSBU. The brief was to simulate various levels of enthusiasm to be used as feedback for the music student's on-stage performance. The students benefit from a show of appreciation as a stress coping mechanism. The Reverberation Chamber shares the same characteristics as the anechoic chamber except for the opposite nature of internal boundaries. These are made very hard and reflective to promote sound reflections and minimal sound absorption. This allows the absorption coefficient of a material sample to be accurately determined using BS ISO EN 354:2003, or sound power levels of large machines, up to 400 Kg, to be measured BS ISO EN 3741:2010. The reverberation created by the numerous sound reflections makes this chamber sound like a large old church!